Why did you write The Healthy Millionaire™ ? I wrote the book to educate about the importance of acquiring and maintaining good health on the road to accomplishing one’s life mission. I found a true need in my naturopathic practice for educating others about prevention of disease through detoxification. I have always believed that to be truly happy and healthy, one needs to periodically cleanse the body, mind and spirit. In my practice, I can only help so many people on a daily basis. My aim is that The Healthy Millionaire™ reaches a large number of people to give them the information they need to make more informed choices for their health and practical methods for acquiring wealth. Who is The Healthy Millionaire™ intended for? The Healthy Millionaire™ is really intended for anyone wanting to improve their health and wealth. It is for the aspiring and already accomplished millionaire, as well as people in all levels of financial status. Is The Healthy Millionaire™ good for teenagers? Yes. Teenagers are at a turning point in their lives. Decisions made during the teenage years help to shape the success of that individual for the rest of their lives. Part of the mission of The Healthy Millionaire™ team includes educating youth about health and wealth so they can set the foundation for a healthy and prosperous life. 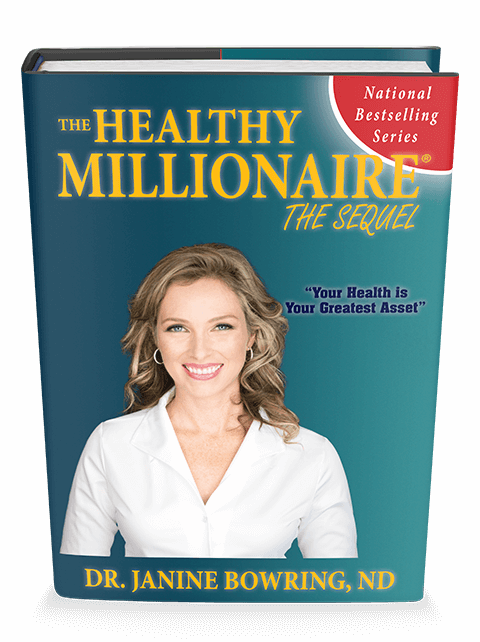 How does The Healthy Millionaire™ differ from other health and/or wealth books? The Healthy Millionaire™ offers very concrete and practical tools for achieving good health through the use of natural medicines. It contains easy to follow charts and text that enlighten the reader on various remedies including herbs, homeopathics and supplements. It is a very unique book in that it includes health on all three levels, being the body, mind and spirit, and ties this into secret ways of acquiring financial prosperity. If I wanted to learn more, is there a seminar or workshop I can attend for The Healthy Millionaire™ ? Yes, The Healthy Millionaire™ team offers weekend seminars in various locations in North America. See our seminars page for more information. I don’t live in one of the cities listed for seminars. How do I arrange a seminar in my city? Under certain conditions, The Healthy Millionaire™ team will visit a host city to deliver a weekend workshop. See our seminars page for more information. Do you plan to write more Healthy Millionaire™ books? Yes. I am already working on the next book in the series. More details to follow. Do you talk about how to detoxify the Liver; Bowels; in your book? Yes. The Healthy Millionaire™ includes very detailed information on how to detoxify the liver, lungs, digestive tract, skin and kidneys. These are the building blocks of our entire being and need to be periodically cleansed and rejuvenated. Do you mention anything about weight loss in The Healthy Millionaire™ ? Yes. I offer valuable advice and some secrets to acquiring and maintaining a healthy weight. Does The Healthy Millionaire™ contain tips about how to make money? The Healthy Millionaire™ does give secrets to making money from a very fundamental and energetic level. However, if you are looking for a book with tips on how to buy stocks, bonds or real estate, you won’t find it here. How do proceeds of The Healthy Millionaire™ help those in need? Proceeds from the sales of the book and its subsidiary products go towards helping children and their families in developing nations. The Janine Bowring Foundation was formed to help those in need who do not have easy accessibility to the basics such as adequate food, water and shelter. For more info go to www.jbfcanada.org. Are there other ways I can help, besides purchasing The Healthy Millionaire™ products?